Peaches are ripe for harvest here in the south. And the weather has turned hot, humid, and hazy here in Tennessee. 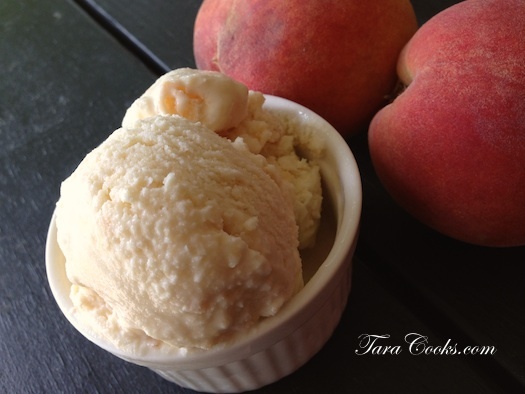 What better way to use those juicy ripe peaches and beat the heat than enjoying a tasty bowl of home made MAPLE PEACH ICECREAM? There is no cooking with this recipe, you just pour, dump, and whisk – then freeze. In a large mixing bowl add the cream, half and half, condensed milk, and maple syrup. Blend with a wire whisk and pour mixture into a half-gallon ice cream freezer. Add ice and salt. Freeze ice cream according to manufacturer’s instructions. Add the crushed peaches the last 5-10 minutes of the freezing process. Transfer any leftovers to an airtight container and store in freezer. Hey Tara! Just wanted to see if you could go on and add the peaches at the beginning? If you prefer chunks of peaches, wait until towards the end. If you add peaches at the beginning, the paddle will turn the chuncks into puree. It will still taste the same. But most folks prefer the chunks of frozen peach in the icecream.